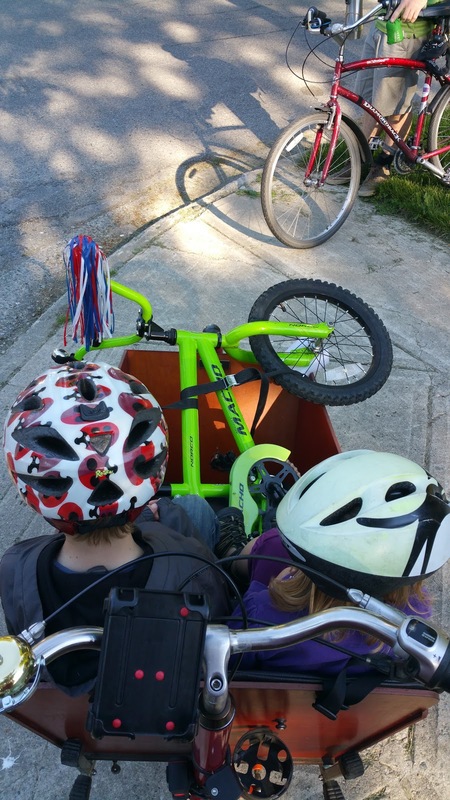 I've discovered another reason that cargo bikes are awesome. I'll call it the sag wagon effect. Let me explain. Linnaeus only started riding his bike without training wheels in March, then riding home from school in April. Three months later, he's riding all over the place, sometimes almost 20km in a day. 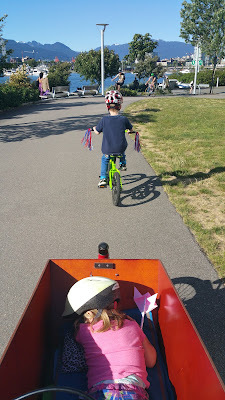 Because we have cargo bikes--the Bakfiets can carry both kids & his bike in the box, the Yuba can tow his bike while he rides on the deck--Linnaeus has the opportunity to ride whenever he wants to, but doesn't have to ride the whole way if he gets tired. There's no pressure like there might be if we had no way to carry him & his bike home. If we didn't have a way to tote him & his bike, we probably wouldn't let him bring his bike on the longer rides that we do, so he'd get fewer chances to ride. A good example of the sag wagon effect is last Thursday's Vancouver Family Biking Pyjama Ride. Linny set out with us on his bike to meet up with the crew at Science World, then rode to Stanley Park. On the way home, he rode from Stanley Park past Science World before getting too tired. That's about 18km total. 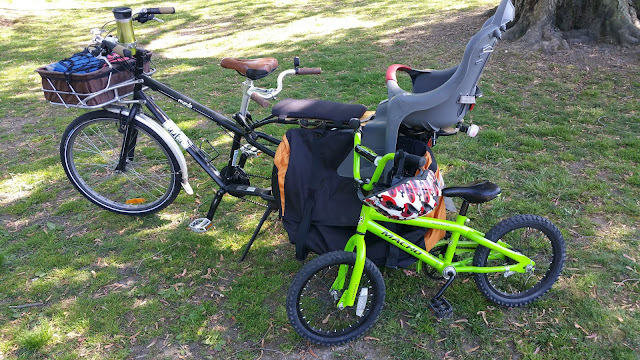 So we popped his bike into the bakfiets & he rode on the deck of the Yuba for the remaining few kilometres home. The cargo bikes have also made it easy to bring his bike to school so he can ride home in the afternoons--riding to school is mostly uphill, but from school is a great way for him to practise road skills & get stronger. He started asking to ride to school in the last couple of weeks, & he was able to ride nearly all the way, with a half-block walk up the steepest bit. Riding home from school every day means he's been regularly riding 20km or more a week, not including some of our evening & weekend rides. Pretty good for a little boy who's not even six years old yet!